Have you ever tried to learn about the rituals or customs followed during a festival? You might roll your eyes and ask what is so interesting about it! Well, each and every festival has an exciting story behind it; only when we go deep that it makes more sense to us. Here is one such annual festival, Puri Jagannath Rath Yatra that has been followed for centuries in Odisha. Puri Rath Yatra 2016 is happening on July 6. Hence, it is exciting to know the importance of such a big event! How did Puri Rath Yatra Began? Puri Rath Yatra was started to honour the completion of Jagannath Temple in Puri. It was built by the King Ananthavarman Chodaganga Deva in 12th Century. Interestingly, Rath Yatra has been taking place since that time at Puri. Lord Jagannath along with his siblings Lord Balabadhra and Goddess Subhadra goes to his aunt's house for a vacation of 9 days. They have lots of fun at their maternal aunt's house (Gudicha Temple) and return to Jagannath Temple. It is the baseline of Rath Yatra. Like any other Indian festival, Rath Yatra in Puri has elaborate traditions that are bound to happen before the commencement of the festival. Each ritual is celebrated as small fairs with all the joy. Obviously, chariots are the main attractions of Puri Rath Yatra. Every year three new rathas (wooden chariots) are made for trinities (Jagannath, Balabadra and Subhadra) with exquisite designs. It takes around two months to build all three chariots. So, on the day of Akshaya Tritiya (April/May), a small ritual called Chandan Yatra which marks the beginning of construction of chariots. Lord Jagannath's Chariot 'Nandighosa' will be 45.6ft with 18 wheels, Balabhadra's Chariot 'Taladhvaja' with 16 wheels and 45ft. Finally, Subhadra's Chariot named Devadalana is constructed with 44.6ft height with 14 wheels. Snana Yatra is nothing but giving a bath to all three deities. Only thing is the water for this bath is obtained from the Suna Kuan (Temple Well) near the Northern Gate of Jagannath Temple. The deities are given elaborate baths from the water stored in 108 pots. After Snana Yatra, the original statues are kept in Anasara Pindi (a place inside the temple) and the proxy deities are taken on 21 days procession in the boats across Narmada Tank. This is called Jhulana Yatra! That's how the whole festival of Puri Rath Yatra takes place every year. 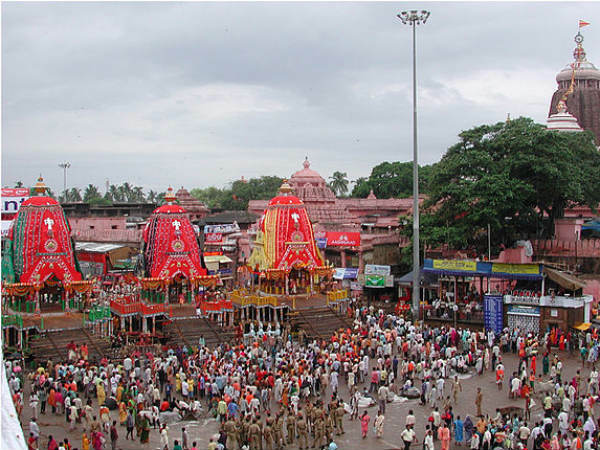 Thousands of visitors come to this city of Puri to witness the grand procession of the Lord.